Ever since its creation in 2004 DLD founder Steffi Czerny and co-chairs Hubert Burda and Israeli tech investor Yossi Vardi have invited some of the brightest and most interesting people on the planet to brainstorm and network at this invitation-only conference in Munich. It is no accident that DLD’s motto is “connect the unexpected”: Czerny, known for her neon-colored tights and warm smile, is a consummate connector who prefers to put the spotlight on others, rather than herself. 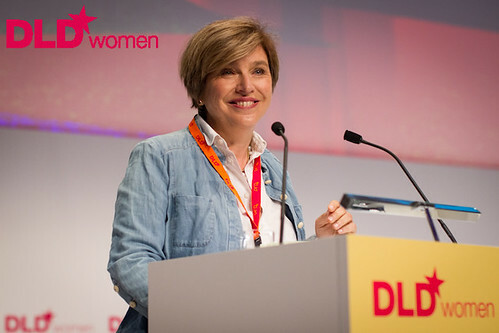 Informilo’s Editor-in-Chief Jennifer L. Schenker takes you backstage to find out more about the woman who launched DLD and what to expect from the conference. I was born in Bavaria. My mother was involved with the German American Society so from my early childhood we always had guests from abroad in our house. I have always been very curious and in the '70s spent a year in the U.S., living on The Farm, a famous commune in Tennessee which was formed by San Francisco hippies. It is interesting to note that four members of the Farm later started the WELL, one of the most influential early online communities. It was all about alternative lifestyles. In the beginning it was fantastic but in the end the people became fanatic and it became like a sect so I went back to Germany, studied political science and history, trained as a journalist at the prestigious DJS (Deutsche Journalistenschule [German School of Journalism]) which was very hard to get into but somehow I made it, and started to write for newspapers and lifestyle magazines. How did you end up creating a conference that the digerati, writers, musicians, artists and scientists all want to attend? Hubert sent me very early to conferences such as TED in Monterey. There was nothing like it in Germany or Europe at this time so I thought, ‘let’s do something like this here.’ I was working with Christa Maar, the head of the Burda Foundation, and went to Israel, where I met Yossi Vardi. We kept running into each other at conferences and decided to launch a conference together. We created a forerunner to the DLD Tel Aviv conference called, ‘Cool People in the Hot Desert' 11 years ago, long before it was in vogue for everyone to think of Israel as the start-up nation. And then we decided to do a Digital Life Design conference in Munich. What kind of conference did you set out to create? We started with 300 people and the concept of gathering people from various backgrounds who are open to new ideas and creating an open atmosphere. At DLD speakers don’t speak and then go; it is more of a community experience. DLD is about investing in people — we invite people who are not famous because of their character. I can tell when someone is burning for an idea — when he or she is totally enthusiastic about what they do. This kind of engagement, of energetic fever — to produce, transform, to disrupt something —is the recipe for DLD and has made the conference successful. [Yahoo CEO] Marissa Mayer was seven times at DLD. The first time she came nobody knew her. Now she is a superstar. When [Facebook CEO] Mark Zuckerberg presented, Facebook only had a few million users. [Chinese artist] Ai Weiwei was invited to speak in 2007. And, we took a bet on a blond girl from New York with a strange name who behaved strangely on the advice of a music agent I know because she had a fire in her — and had Lady Gaga perform live at DLD before anyone had heard of her. I connect with these people through a network of friends, and I trust and act on their recommendations — otherwise you would always see the same people at the conference. DLD is an ecosystem — you have to feed it carefully — not too much fertilizer — not too much water — and then it works. Since much of the conversation at DLD centers around digital disruption it is not surprising that previous speakers have included Google chairman Eric Schmidt, YouTube founder Chad Hurley and Wikipedia founder Jimmy Wales. But the mix has also included scientists such as biologists Craig Venter and Richard Dawkins, authors such as Nassim Taleb, musician Yoko Ono and Nobel Laureates Martti Ahtisaari, Muhammad Yunus and Daniel Kahneman. And you have made some very unusual pairings on stage. Can you give us some examples? Former Facebook president Sean Parker and Alchemist author Paulo Coelho; Esther Dyson and her father, the physicist Freeman Dyson and her brother [author and science historian] George Dyson; Nobel Laureate Marttii Ahtisaari and his son [technology entrepreneur] Marko, to name a few. DLD is celebrating its 10th anniversary this year. What are your goals for the conference going forward? I would love for the network process to be even more intense –– to be able to pair all the relevant people to each other. Content & Context [this year's theme] not only refers to the fact that technologies are starting to “understand” things about us and our environment. It also describes DLD in a nutshell — connecting people and ideas to inspire each other and discover common patterns. This article was published in Informilo. You can follow DLD14 „Content & Context“ on the livestream on our website and find regular updates on the DLD14 programme and speakers here.